1958, Poland, Andrzej Wajda. 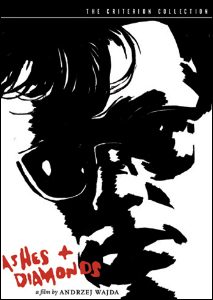 The final part of the trilogy features Cybulski (the Polish James Dean) as a fighter in the first days of peace waiting to assassinate a Communist official. Least satisfying of the trilogy. See also A Generation (Part I) and Kanal (Part II). For more details, see tt0052080 on The Internet Movie Database.